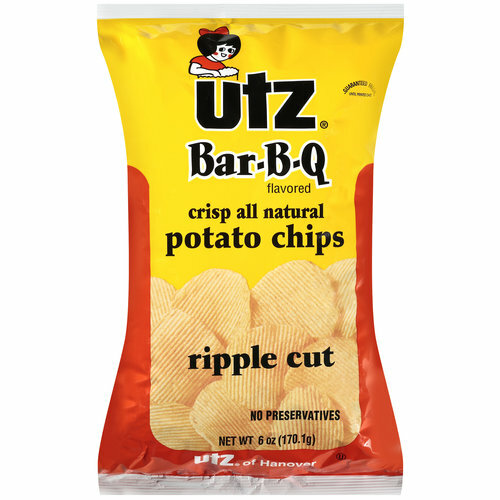 With a constructive critique approach, we would say the Utz logo is charming and historic. The colors are bold and bright, but oddly, they are not flavor colored, they just have random colors. Utz must be very confident of their position in the marketplace because all of their own brand bag designs are very dated and border on inappropriate for a modern market. In this instance, the only differentiation between these and the regular variety of the same flavor is the uninspiring 1970s black lettering that says 'ripple cut'. The thicker nature of these narrow Ridged Chips meant they required a more substantial slice of potato to ensure most stayed whole. The cooking process is the same as for Regular Chips however, so the crunch will be dictated by the thickness of the Chip. While the Regular version had a crispy, snappy smash, these had a firmer, first crunch loud, second crunch soft, feel to them. Simply because they had gentle, thin Ripples, these chips had more character than the regular Chips of this flavor. There were few oil bubbles and the complexion was clean and well blanched. There was some orange powder about, but it was haphazard. A Nose Plunge Test revealed a mild Barbecue aroma. When this particular flavor does not harbor a Barbecue smell within its unopened packaging, it does not auger well. These Chips transfer the aroma to the taste. The flavoring was not sticky and sweet like many Barbecue Chips, and it did have a little kick. It worked well with the thicker potato to provide a salty, Barbecue flavoring that would appeal to most.